On the 4th of July, 2002 in Philadelphia, supporters of Mumia Abu-Jamal gathered at City Hall for a rally and then marched down Market St. to the Liberty Bell to protest Colin Powell receiving the “Liberty Award”. Part one of this two-part photo-essay by Hans Bennett, documents the beginning of the day at City Hall. Part two (to be released tomorrow) documents the action at the Liberty Bell. Part two will also feature an original essay about the day including transcripts of Pam Africa and others’ speeches. In this photo, Pam Africa of MOVE and the International Concerned Family and Friends of Mumia Abu-Jamal leads hundreds of protesters down to the Liberty Bell after departing from city Hall (seen in the background). 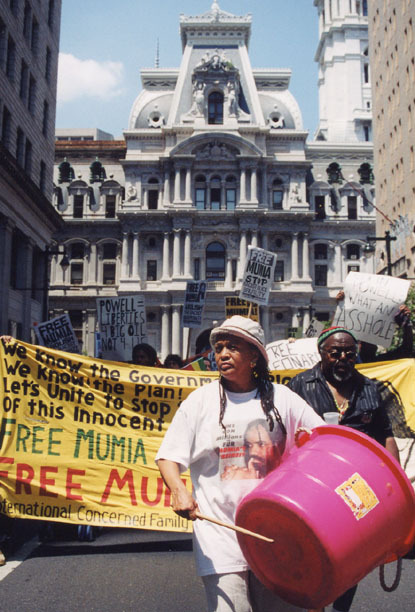 On the 4th of July, 2002 in Philadelphia, supporters of Black political prisoner Mumia Abu-Jamal gathered at City Hall for a rally and then marched down Market St. to the Liberty Bell to protest Colin Powell receiving the “Liberty Award”. Part one of this two-part photo-essay by Hans Bennett, documents the beginning of the day at City Hall. Part two (to be released tomorrow) documents the action at the Liberty Bell. Part two will also feature an original essay about the day including transcripts of Pam Africa and others’ speeches.